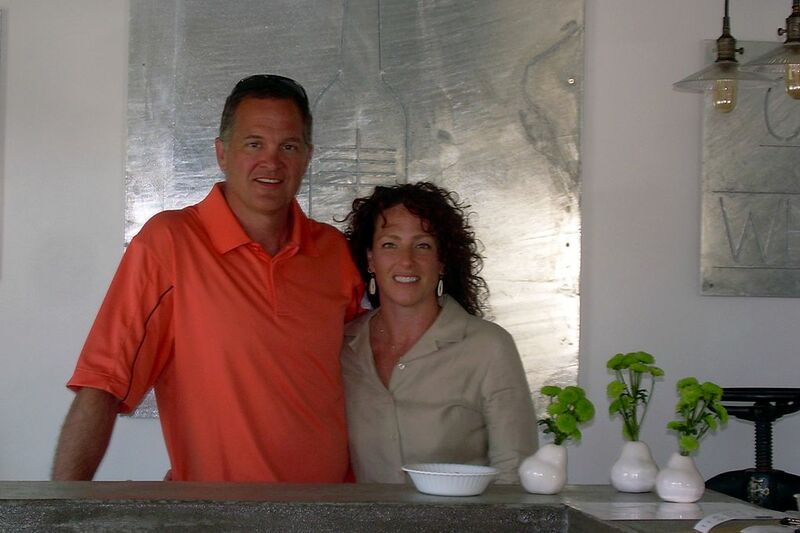 On eight acres in Eastern Washington, Mark and Tami Garvin have uncorked a second career. Two years ago, the Seattle-area couple retired from Boeing after more than three decades of employment. 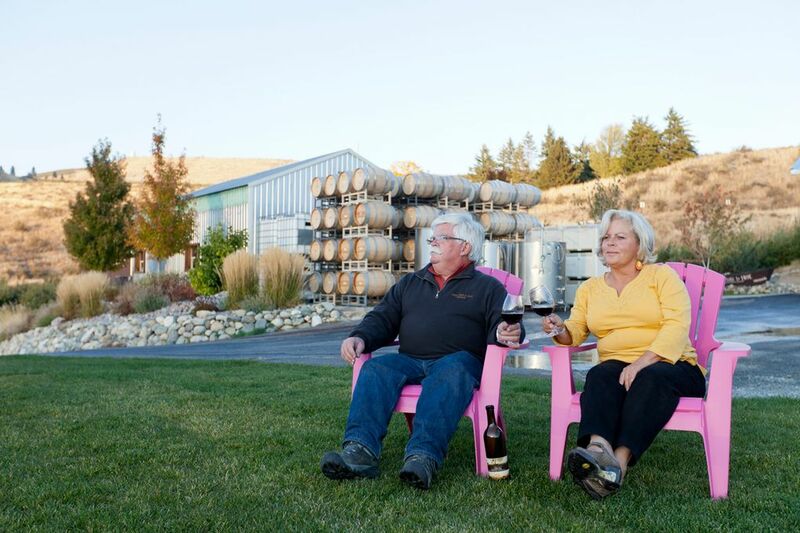 Last year, they opened Tipsy Canyon Winery, one of the Lake Chelan Valley’s newest wineries, set in the rolling hills behind Manson. This year, valleywide events and celebrations will mark the 10th anniversary of the region’s AVA, which was established in 2009. It’s a convenient excuse to drive over the pass to visit three wineries that offer unusual or new takes on the tasting-room experience. Here’s a look at a few of the newest offerings to get things rolling. Joining those celebrations this May, Tipsy Canyon’s new 1,600-foot tasting room will offer leather sofas and tables where visitors can enjoy views, along with 11 wine tastings, crackers and cheese supplied by a local shop. From the leather sofas, visitors can enjoy expansive views of Roses Lake and the Cascade Mountain foothills. 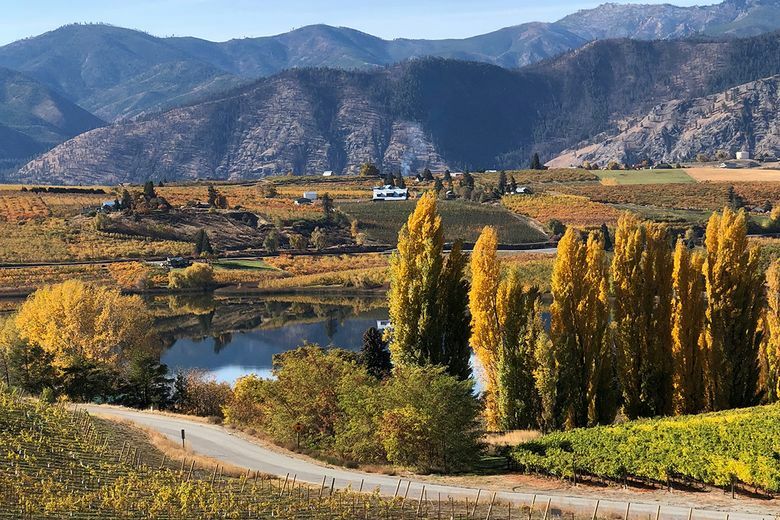 Views set Lake Chelan apart as a wine-tasting region, Garvin says; many wineries rest amid stream-fed lakes, stunning mountains, and sun-lit blue skies for 300 days every year. While the vineyards are an escape for city-dwellers, wines didn’t need to travel far from grape to glass at Tipsy Canyon. Most of the winery’s grapes are grown nearby, and the focus is on single varietals, with some Bordeaux-style and rosé blends. The couple made their first barrel nine years ago, using 400 pounds of grapes. This past harvest, they crushed more than 58,000 pounds, and have recently planted plots of pinot blanc, chardonnay and syrah, among others, hoping to grow at least one-fourth of their own grapes, in a few years. Two-thirds of Garvin’s visitors have been referred from other wineries. “While we are competitors, we’re also rooting for each other,” he says of the wine community. Smart visitors head over the pass in spring and fall, he observes, to avoid summer’s booming season, when hotel rooms can be more challenging to snap up. “Our wineries provide that opportunity to kick back, enjoy the view and slow down a little,” Garvin says. It’s not easy to find One Wines, a couple-owned venture in the heart of Chelan – most locals don’t even know it’s there. But the white house with the contemporary interior is worth the hunt. Because when a customer walks in, they’ll discover a unique tasting pairing – for example, a rosé might be paired with a strawberry shortcake cookie dipped in white chocolate. White wine teams up with sea-salt caramel bits, and red wine with a chocolate-covered blueberry. Because they only offer three wines, Jo Cowell and her husband, Greg Cowell, present only the best produced that year. Customers have minutes to decide which bottle to bring home, Cowell says, so she wants them to wind up pleased with their purchase. To do so, you need to throw off the palate between sips and surprise the brain, to really take in all of the wine’s flavors, she says. So the three wines get matched with three sweet samples. Customers are urged to sip, and bite. On the next sip, “you’ve found the other side of the wine,” she says. One of the more unusual pairings? A red wine with fudge-dipped coconut sandwich cookies. “It was surprising how much spice it pulled out of the wine,” she says. After selecting a bottle, customers can create a pairing of their own. Procure lunch from the nearby taco truck and ask Jo about the outdoor area beyond the white picket fence. Then picnic upon the tasting room’s dog-friendly, shaded outdoor grassy area, brightened with cheerful red Adirondack chairs. Adults who sidle up to the 20-foot long tasting bar at Hard Row to Hoe will hear the somewhat-scandalous inspiration for the winery’s risqué name and wine labels from owners Judy and Don Phelps. They’re serious about wine, and save the fun for the tasting room, she says. While Phelps’s stories are best heard first-hand, the winery’s name is inspired by a rowboat taxi service ferrying workers from the lake’s landlocked copper mine to Point Lovely, where female companionship could be found – for a price. The winery’s wall hosts one of the brothel’s original iron beds. North Shore’s winding side roads deliver visitors to Hard Row to Hoe, one of the region’s oldest wineries. 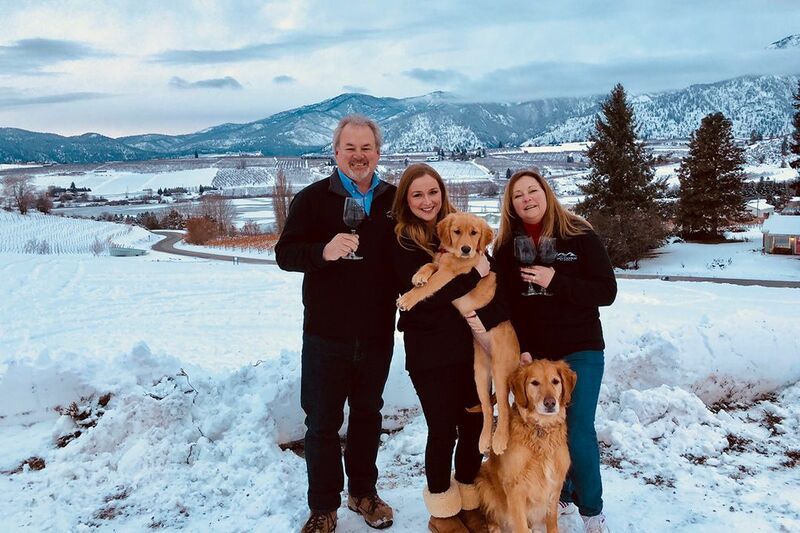 Here, all wines – ranging from pinot noir and riesling to syrah and malbec – are made on premises using Lake Chelan AVA grapes and the winery’s own organic grapes. “When people come here, they really feel like they’re in wine country, surrounded by vines and orchards,” Phelps says. Spring days are dry, sunny and in the 60-degree range, before climbing into May’s 80s. In April, wildflowers burst forth from the surrounding native shrub steppes. To qualify her wine for salmon safe certification, Phelps supports and maintains a buffer of Pacific Northwest native habitat around the vineyards, which includes wildflowers. “The wildflower balsamroot is spectacular in April,” she says of the bright yellow, daisy-like flower. Picnickers can bring food to enjoy along with a bottle of wine on the tasting room’s patio around firepits on cooler days, or on warmer days, the shade-cooled lawn overlooking the organic vineyard. Those who’ve forgotten provisions can assemble a lunch of cheese, crackers and salami. Dogs and kids are welcome, and lawn games can entertain, once you’ve heard all the great stories. In Lake Chelan you’ll find four seasons of wine, sun, stunning natural beauty and adventures you can tune to your own tastes.